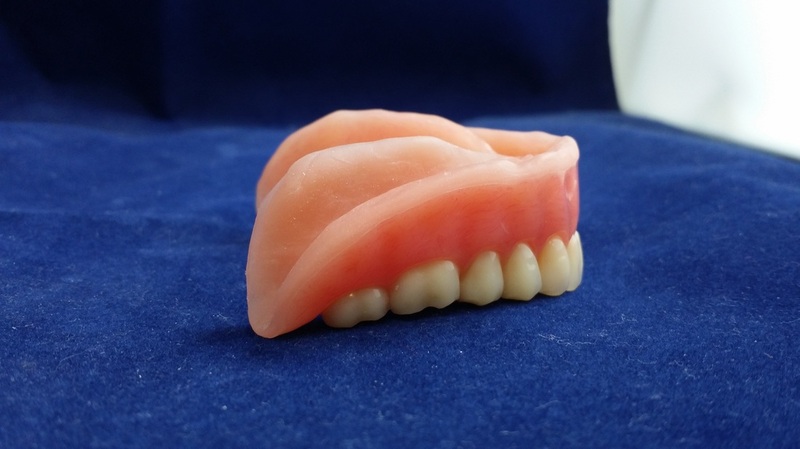 We can add many different types of attachments to your dentures or partials. We are not limited to the attachments on this page. 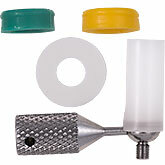 These are just examples of different types of attachments we can use. 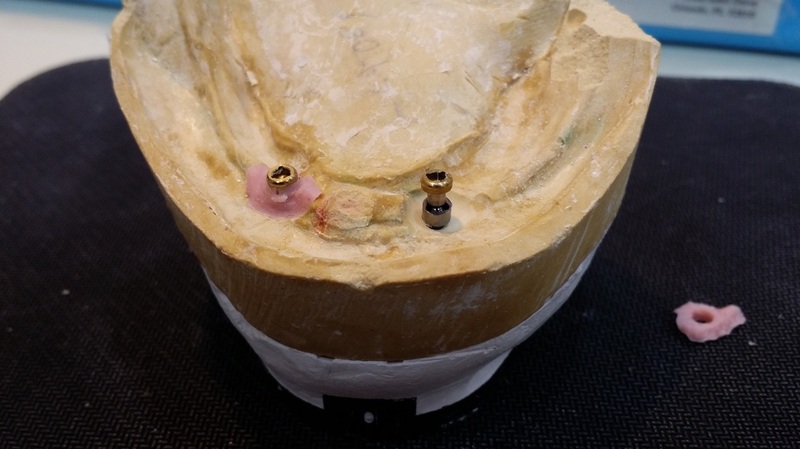 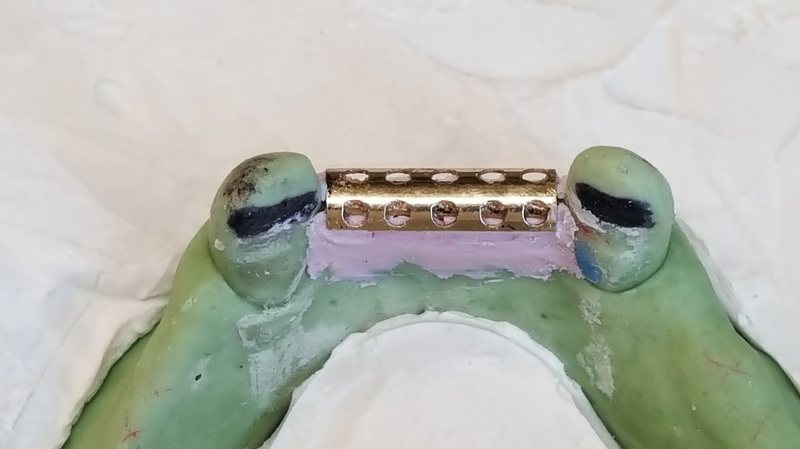 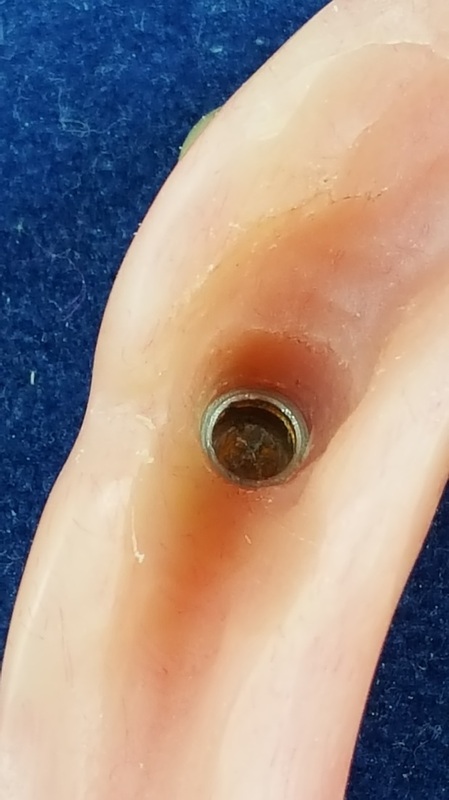 This isn't really an attachment, but if you have a patient with Ball Abutments and are not sure what to do with them, we recommend wrapping them with Molloplast B. You can either add Molloplast B around just the balls or cover the entire denture. 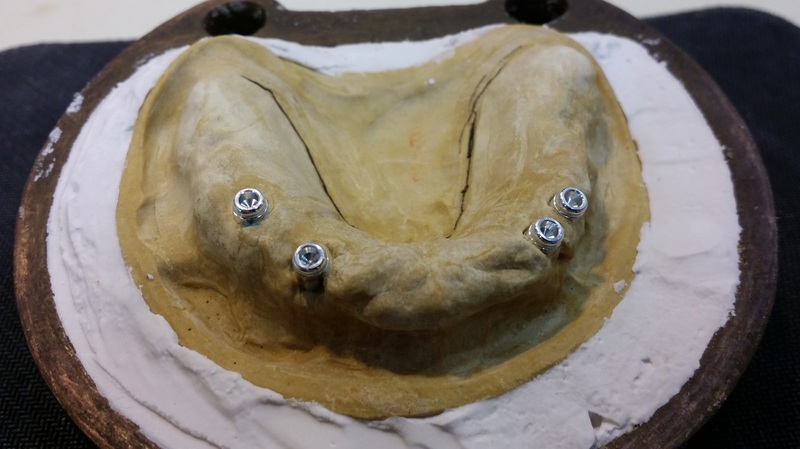 This case we cover the entire bottom for the patient's comfort. 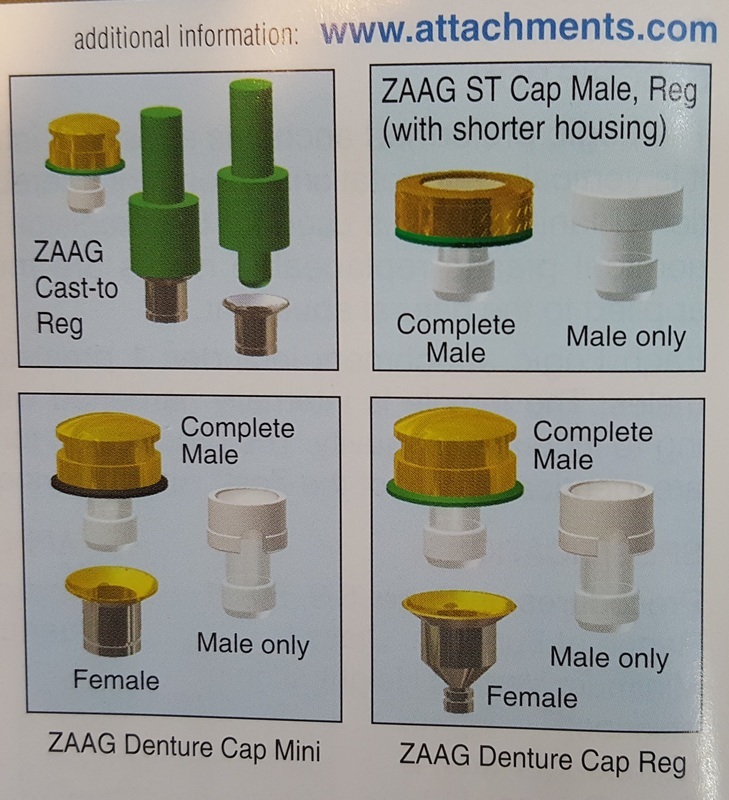 There are many different Ball and Cap brands, but they all work about the same. 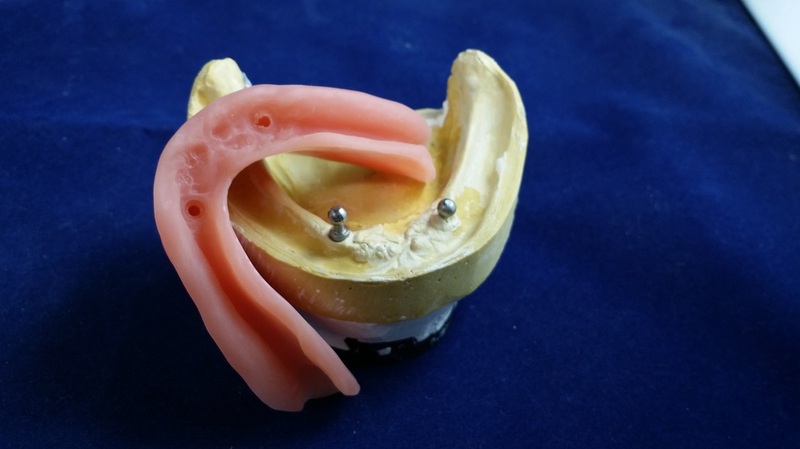 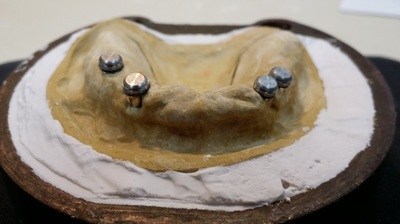 There is a Ball abutment on top of the implant and a Cap attachment imbedded in the denture. 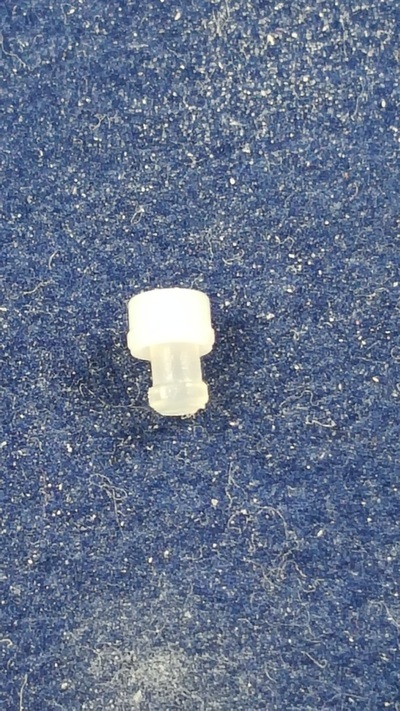 This type of attachment is similar to the cap, except it has an O-Ring inside of the metal housing instead of the nylon liner. 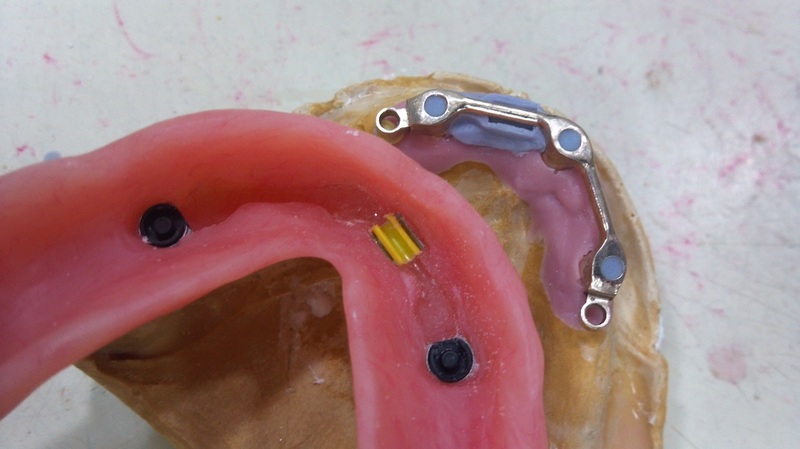 The 3M ESPE's MDI Mini Dental Implant system is a great choice and is easy to use. 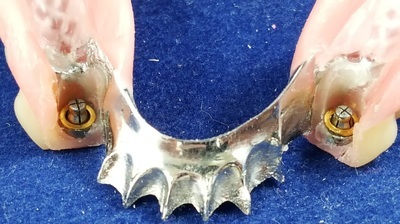 CEKA Attachments are an older type of attachment. 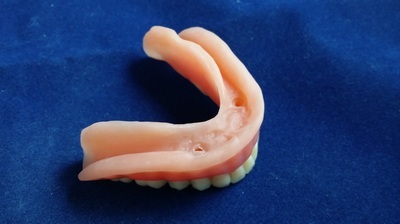 They still make them, but they are not as popular as they use to be. They work like an ERA, execpt instead of the Nylon ERA inserts, CEKA has a metal spring. 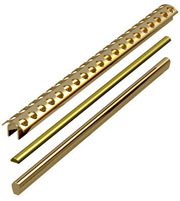 Dolder Clips are used with Dolder shaped bars which can be either be U-shaped or Ovoid shaped. The Ovoid shape makes the attachment resilient providing vertical compression along with the rotation both style of bars have. 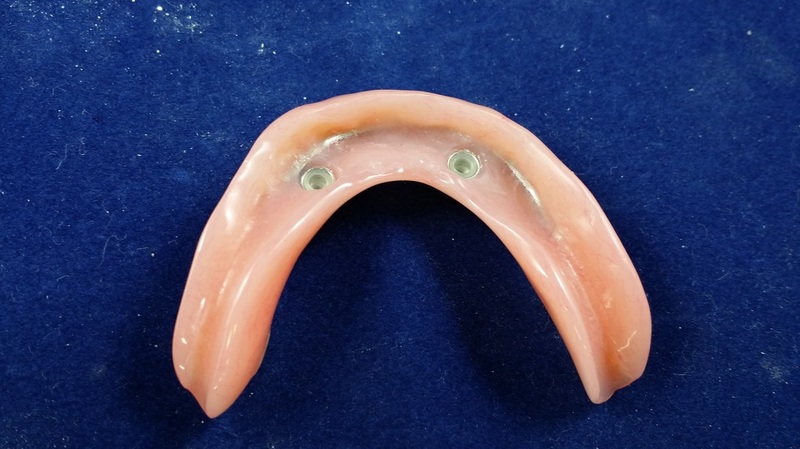 Hader Clips are made to clip onto a Hader bar, which is the old standard overdenture bar. Hader bars are also used to splint crowns together like this case. 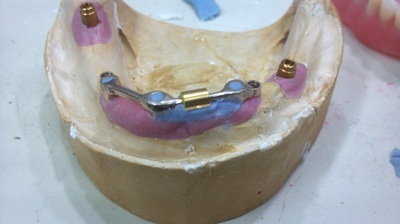 The yellow Hader clip is seated into the Metal Housing and then clipped on the bar. The Metal Housing makes it real easy to change the yellow clip when it wears out. Also, this model has a RV ERA attachment on the distal of #28. Both attachments will be inbedded into the partial. 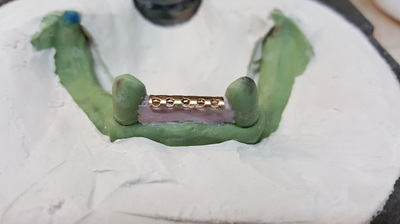 The other clip you need to know about is the CM Rider, also known as the Gold Hader Clip. If the Hader clip doesn't fit the bar, the CM Rider will do the trick. 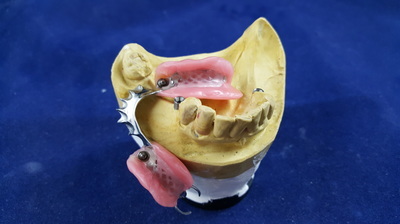 This case used three clips to hold the denture in place. 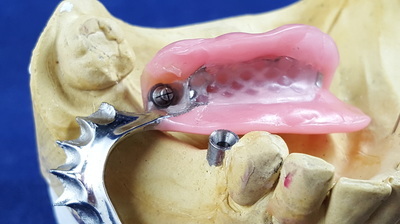 ERAs are a good all around attachment. 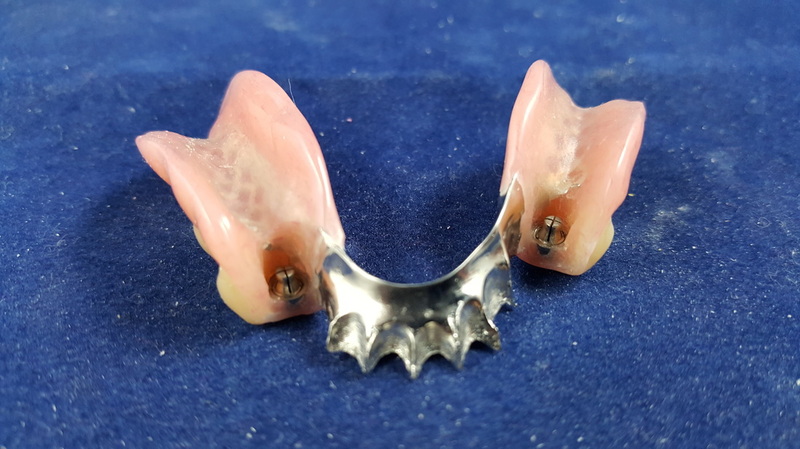 We use ERAs mostly for partial frames that we are replacing the posterior teeth and with overdenture implant bars. 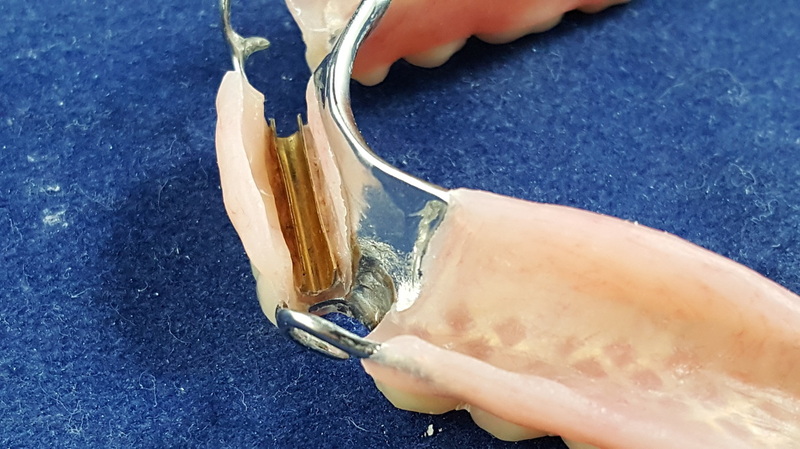 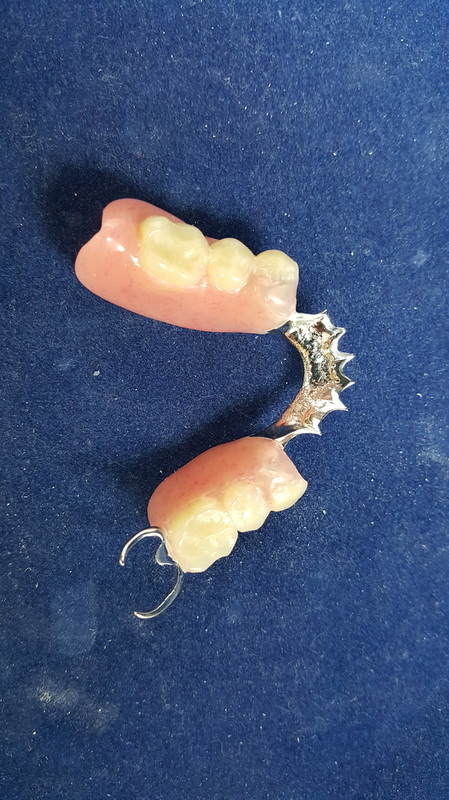 This case has an overdenture bar with a Hader Clip in the anterior with two RV ERAs on the distal ends of the bar. It also has two Locator abutments on the implants in the posterior edentulous areas to stabilize the overdenture. 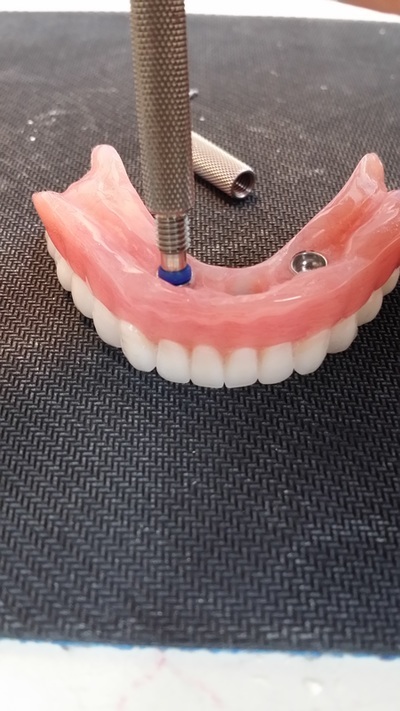 The Locator by Zest Anchors is another simple to use attachment. 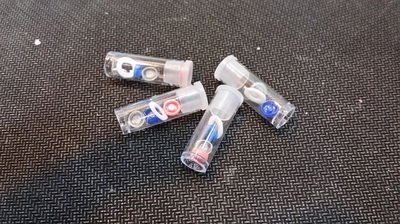 It is similar to an OD type of ERA. 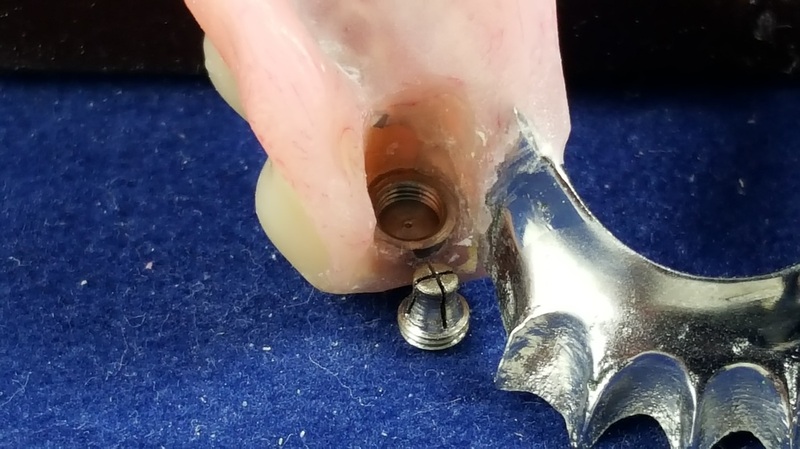 There is a Locator abutment you screw into the implant and a Metal Housing that is imbedded into a denture. 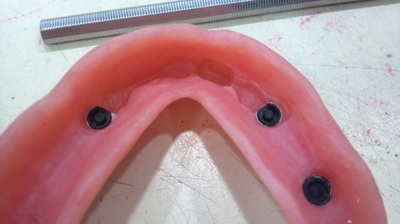 We usually use Locator analogs for our models like this upper model with the four Locators. 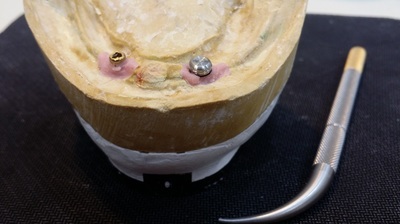 The lower with two Locators, the implant analogs were used for the model. 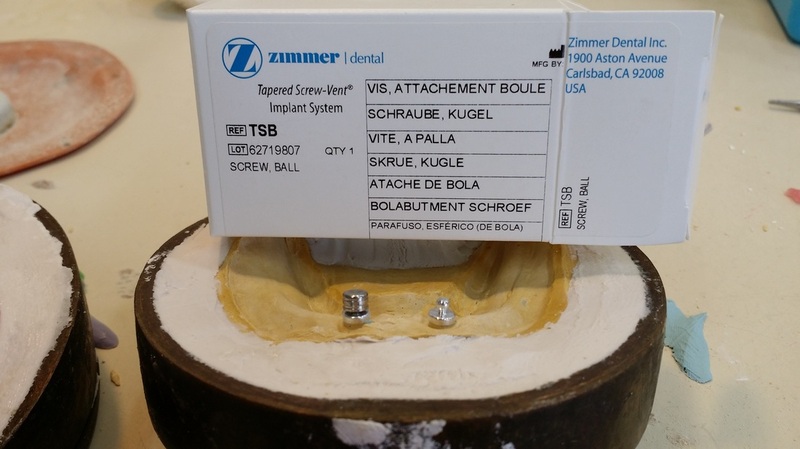 We used the Locator abutments just like you would by screwing the abutments into the implants. It is best to have the abutment in place on the implants for the impressions. 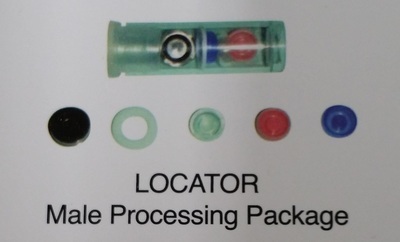 The Male Processing Package has the Metal Housing with the nylon inserts needed. 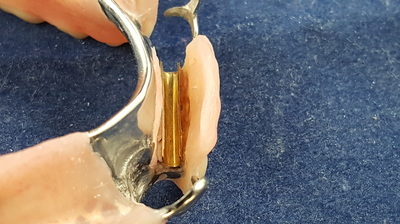 It is easy to change and seat the nylons as they just snap into the Metal Housings. 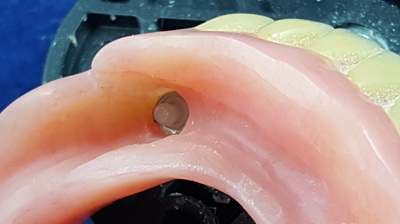 Stern Snaps are another simple attachment that snaps right over an abutment like the Locator attachment and can even be used with the Locator abutments. 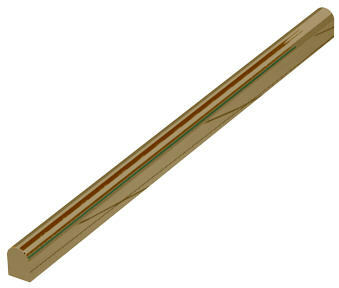 The do not have a housing like the Locators or the ERAs, but work the same. 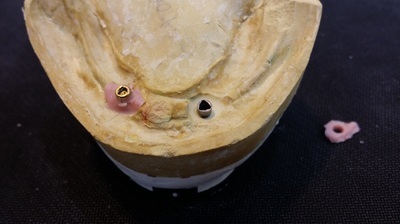 You can even get the angled Stern abutments that you can adjust up to 20 degrees. 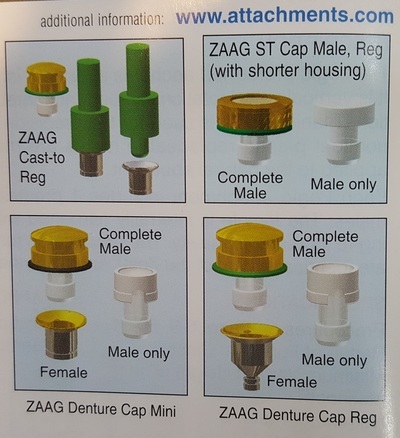 The ZAAG Attachment is an Intra-Radicular attachment for endodontically treated roots. 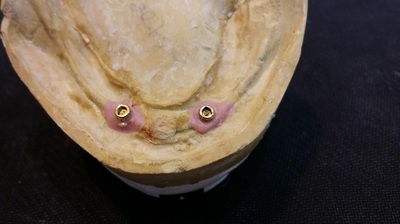 Basically the female part of the attachment is cemented into a tooth and the male part into the partial or denture. This attachment is great when you do not have a lot of space and want to use an existing tooth for support. Zest makes this attachment, the same company that makes the Locator Attachment. The pictures below, we just replaced the male nylon of an existing denture.